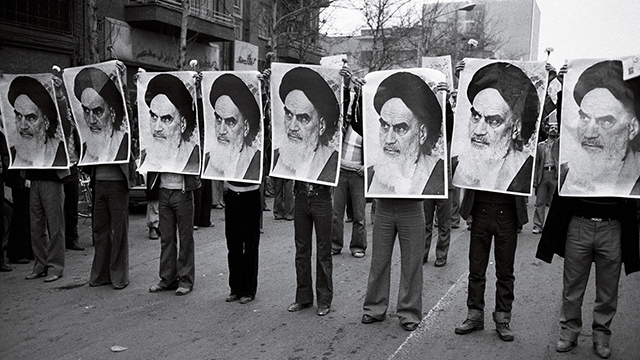 Row of demonstrators holding Ayatollah Khomeini's photo during the Iranian Revolution, Tehran. 1978. (Photo: Unknown via Wikimedia Commons.) CC BY-SA 4.0. UCLA International Institute, April 4, 2018 — Cold War-era conflicts between socialists and Islamists in Iran and Afghanistan often go unexamined by scholars. When they are analyzed, they are generally perceived as proxy conflicts between the United States and the USSR. 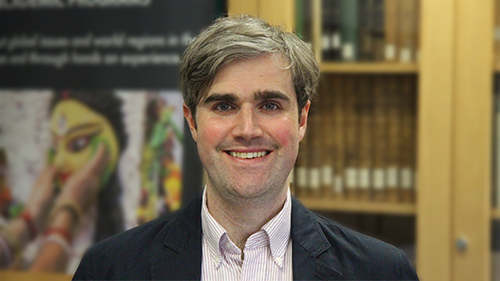 In a late February talk presented as part of the Afghan Studies Lecture Series, Timothy Nunan, Freigeist Fellow at the Free University of Berlin, argued that this approach de-centered regional conflicts away from Iranian and Afghan political history in particular. The event was organized by the Program on Central Asia of the UCLA Asia Pacific Center and cosponsored by the UCLA Center for European and Russian Studies. Nunan argued that U.S.-Soviet antagonism during the Cold War created new spaces for Islamic actors in the Middle East. Scholars of the Soviet Union, Middle East and Central Asia, he said, would be better served by examining the history of socialist and Islamist conflicts through a transregional, intersectional lens. Conflicts in Central Asia during this period were not simple proxy wars, he said. Rather, they were unique decades-long conflicts between Islamists and socialists that were conditioned by the interaction of the Soviet Union with Iranian and Afghan actors. “Decades after the end of the Cold War, the Iron Curtain still influences the way we write about the Silk Road,” said Nunan. He pointed to the presence of Russian steel plants, Czechoslovak factories and Soviet farms in Afghanistan as physical examples of the complicated history of trade between Central Asia and the former Eastern Bloc. However, interaction between the region and Russia was shaped not only by economic markets, but also by ideology, which in turn affected political discourse. Although the theocratic Islamic Republic of Iran adopted the slogan "Neither East nor West, only the Islamic Republic,” Nunan said that multiple ideals of the secular USSR, together with the institutions of Cold War–era Russia, undeniably shaped the strategy and political activity of the Islamic Republic. Similarly, Afghanistan’s history of political turmoil was intrinsically linked to the USSR. “During the 1960s, Afghanistan became a hot house for Cold War ideologies,” Nunan explained. “It was a parliamentary monarchy facing repeated efforts to carry out land reform that went nowhere. Frustrated students looked to the Soviet Union and China for ideological alternatives,” he said. Inspired by the Soviet Union, a group of Afghan Marxists and army officers toppled the regime in 1978 and proclaimed the Democratic Republic of Afghanistan. “Once they entered power, these Afghan communists seemed more interested in murdering one another than in governing the country, much less combatting an Islamist insurgency,” said the speaker. Disturbed by the erratic behavior of the Marxist regime, Moscow dispatched soldiers to Kabul in December of 1979. When these troops failed to quell the emerging civil war, they stayed, soon forming an occupying force of 100,000 soldiers. “If we define globalization as the increasing interaction of peoples, states or countries through the growth in the international flow of money, ideas and culture, then the Soviet Union had indeed facilitated a kind of socialist globalization,” said Nunan. This socialist globalization, moreover, enabled Afghan and Iranian leftists to see themselves as sharing a common fate in the anti-imperialist movement. During research in Berlin, Nunan uncovered evidence of this perceived commonality when he interviewed former members of the People's Democratic Party of Afghanistan, or PDPA. (The PDPA established the Democratic Republic of Afghanistan and was well-known for its ties to the Soviet Union.) The historian also listened to archival recordings of an oral history of the Iranian communist Tudeh party. Both sources revealed the shared dreams and disdains of leftists in Iran and Afghanistan. “[The PDPA interviews] revealed hopes for twin revolutions in Iran and Afghanistan, which never came to fruition,” said Nunan. Leftist parties and the Soviet Union supported Ayatollah Khomeini as an enemy of American imperialism and welcomed the seizure of the American embassy in Tehran. The Tudeh oral history recordings also highlighted that Iranian Islamists and Soviet communists intended to use Afghanistan as a base for their respective international projects. In early 1983, however, the leadership of the Iranian Tudeh party was arrested, causing an exodus of party members from Tehran to Kabul. While Tudeh members had moderate success in their mission to spark conflict between the Iranian state and Iranian minorities, such as Azerbaijanis and Kurds living along the Iranian border, the arrests greatly debilitated the movement. “By the end of the ‘1980s, both the Soviet Union and the Islamic Republic of Iran shifted their priorities in Afghanistan away from socialist and Islamist internationalism, [respectively]” said Nunan. Iranian efforts to overthrow the Saudi regime also tapered off around this time, and Iran and the Soviet Union were approaching a rapprochement before the USSR unraveled in 1991. For Nunan, the period that preceded and immediately followed the collapse of the Soviet Union offers further opportunity for nuanced historical analysis of events in the Middle East and Central Asia. “These ideologies couldn't be taken for granted three decades ago and they can't be taken for granted today, either,” he said. The best way to make sense of these ideologies, he concluded, is for scholars to approach Central Asia through the lens of international and global history, rather than that of the Cold War.